Part Used & Method for Pharmaceutical Preparations: The cuttlefish is caught from April to August. The bone is removed from the fish and dried for twenty-four hours. Properties & Taste: Salty, astringent and slightly warm. 1. Hemorrhage. Cuttlefish bone (Wuzeigu) is used with Rubia root (Qiancao), Carbonized petiole of windmill palm (Zonglutan) and Donkey hide gelatin (Ejiao). 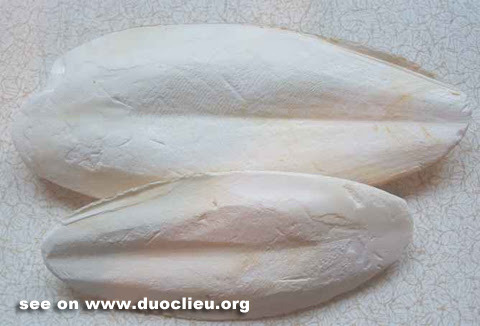 Cuttlefish bone (Wuzeigu) can be used alone for bleeding due to external injuries. 2. Deficiency of the kidneys manifested as seminal emissions or leukorrhea. Cuttlefish bone (Wuzeigu) is used with Dogwood fruit (Shanzhuyu), Dioscorea (Shanyao), Dadder seed (Tusizi) and Oyster shell (Muli). 3. Stomach pain and acid regurgitation. Cuttlefish bone (Wuzeigu) is used with Tendrilled fritillary bulb (Chuanbeimu) in the formula Wu Bei San. 4. Eczema or chronic ulcers. Cuttlefish bone (Wuzeigu) is used with Phellodendron bark (Huangbai) and Natural indigo (Qingdai) for external use in powder form. Cautions & Contraindications: This substance is contraindicated in cases with deficient yin and excessive heat.